The Nubian ibex (Capra nubiana) is a desert-dwelling goat species found in mountainous areas of Algeria, Israel, Jordan, Saudi Arabia, Oman, Egypt, Ethiopia, Eritrea, Yemen, and Sudan. It is generally considered to be a subspecies of the Alpine ibex (Capra ibex), but is sometimes considered specifically distinct (Capra nubiana). The wild population is estimated at 1,200 individuals. Nubian ibexes stand around 65–75 cm (2.1-2.6 ft) tall at the shoulder and weigh around 50 kilograms (110 lb). Nubian ibexes are a light tan color, with a white underbelly, in males there is also a dark brown stripe down the back. Nubian ibexes have long thin horns which extend up and then backwards and down. In males these reach around a metre in length while in females they are much smaller (around 30 cm or 12 in). Nubian ibexes live in rough dry mountainous terrain where they eat mainly grasses and leaves and are preyed upon by leopards, eagles and bearded vultures. Nubian ibexes live in herds composed solely of males or females. They are diurnal, meaning they are active during the day and rest during the night. 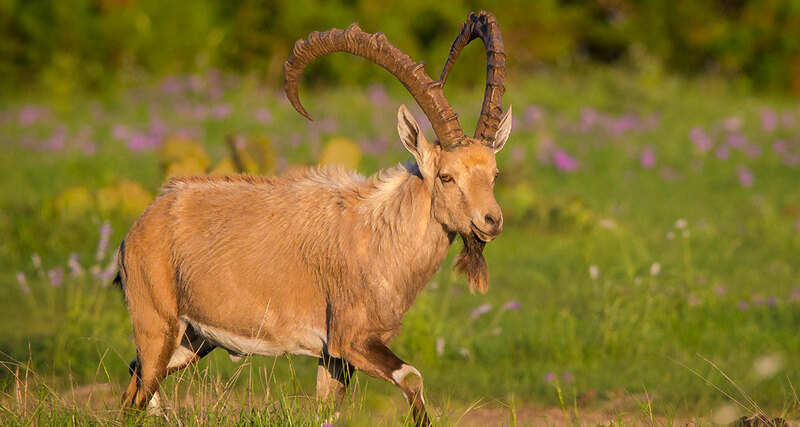 On 16 March 1959, the British established the Yob Wildlife Reserve in northern Eritrea specifically to protect significant populations of Nubian ibex in the area.